Western criticism of China’s approach to Africa is misplaced, but Beijing should place more emphasis on labor relations. 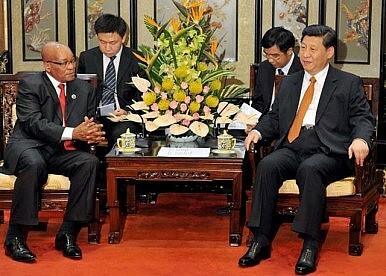 China has strong political relations with African nations. China is generally accepted in Africa as an economic and political ally, since it is viewed as a fellow “southern” region, offering more than business for profit alone. By contrast to Western nations, many of whom were former colonial powers, China is viewed by African political leaders as an equal, not an imperialist, partner. China established the Forum on China-Africa Cooperation to promote cooperation between China and African political and civil institutions. Diplomatic relations are genial, since African leaders are interested in building up their domestic economies. However, China has made strong political connections because it has been willing to do things that some nations may consider unethical, including selling weapons to countries run by autocratic regimes with poor humanitarian records. China has sold arms to the Zimbabwean and Sudanese governments, which helped the African leaders maintain power and even kill civilians. This has been viewed by many onlookers as heinously unscrupulous. Further, many economists view natural resource extraction as a means of oppressing populations. Even though the extraction is carried out with willing African counterparts, it is argued that supporting commodity dependence and reducing the supply of natural resources for domestic use will, in the long run, impoverish African countries. This is because the resource extraction is performed in order to export the goods to China, to benefit China’s growth, rather than Africa’s. Chinese companies hire African workers, but pay extremely low wages and treat workers poorly. Workers frequently suffer verbal and physical abuse from Chinese managers, and are treated as inferiors. Safety standards for African workers are low, as workers are employed in dangerous conditions with inadequate safety gear. Chinese products are priced so low that they often outcompete local African businesses, undermining local labor in that way as well. What can we grasp from these contradictions? China has sought to build strong economic ties to Africa, but has intentionally steered clear of charged political or social issues. The fact that China’s approach to Africa is so laissez-faire toward humanitarian issues is precisely what inflames onlookers. The Western aid view that Africa requires financial and moral intervention stands in stark contrast to Chinese relations with the continent. Yet China’s connection with Africa is precisely what some economists have called for. For example, William Easterly and R. Glenn Hubbard have separately argued that business and entrepreneurship are better for African economic development than charity, that African businesspeople have proven themselves capable and would be better off generating growth in the marketplace. There is no doubt that China is changing Africa’s image away from an aid-dependent continent to a business-focused region. Ironically, as many have argued with regard to the practice of multinationals in China, providing low wages and poor working conditions creates a “race to the bottom,” in which ever-fiercer competition reduces the living standards of workers, dampening human development. This vigorous competition may undermine small businesses. In other words, in Africa, China’s own experience with American companies is writ large. This may not lead to long-term growth, as with low wages, African workers may be unable to purchase the Chinese goods that were meant for the very same African markets. Therefore, although China’s relationship with Africa has stimulated growth in many African nations, China must view labor relations as an essential component of good business practices. In sum, China’s relationship with Africa is multifaceted, but Chinese intervention in African can stimulate business if sustainable economic practices are adopted. The Western view of Africa as requiring monetary and moral aid has not worked, and China’s involvement in the continent, while beneficial for China itself, has served to build up much-needed infrastructure and generate some profits for African nations. Criticism of Chinese practices as well as healthy competition from Western nations may serve to improve China’s labor relations in Africa. Growth and development in Africa will benefit other nations in the long term. China’s Bold $10 Billion Investment in Nigerian HydrocarbonsGreen Shoots Sighted for Asia’s EconomiesAn Oil Discovery Before Systemic Reform in Pakistan Would Be a TragedyIn Myanmar, Jittery Investors Threaten Long-Term DevelopmentAsia’s Elections: Market Moving or More of the Same?